In the face of unprecedented financial penalties for failure to comply, not all organisations are celebrating the coming of GDPR. Many see it as an administrative burden creating little or no value for their organisation or its customers. In stark contrast to these pessimistic views of GDPR, a growing number of progressive firms are set on turning it to their advantage going beyond compliance alone. From the outset, a fresh approach is essential. GDPR in no way resembles earlier initiatives such as Quality. Here, doing the very minimum to get through certification was for many, preferable. For GDPR, this is not an option. With the exception of very small businesses, the ability to systematically prove compliance and to go on to avoid potential data breaches requires rigorous procedures and processes. In turn, these must be validated from start to finish and through the many ‘if-then’ permutations that complex business processes typically follow, a task not for the fainthearted. Identifying the right approach is essential. Whilst GDPR guidelines make frequent reference to the need to document procedures, it makes no specific recommendation as to the medium to use, notably text or flowcharts. Here, lessons can learned from some of the more progressive companies that have pursued transformation initiatives such as ISO 9000, Six Sigma and Lean. Process models, information-rich versions of flowcharts, with performance metrics, dynamic links – both up and down as well as across or processes hierarchies, and linked to external documents and data, have created new degrees of clarity and transparency as to how business operates. The new levels of transparency process models create, go beyond the realms of textual documentation or one-dimensional flowcharts. Risks, roles, responsibilities and more besides becoming objects stored in a database within the process modelling tool or Business Process Management Suite (BPMS). With risks, roles, and responsibilities assigned to workflows and tasks, their occurrence and impact can be easily traced across the entire processes landscape. Mitigation of risks can then follow so reducing the likelihood of a breach, bolstering evidence of compliance or exposing the potential for failure in the process. GDPR is not about simply mapping the ‘as-is’ but about the need to create new procedures in place, as prescribed by the UK’s ICO. Process models are the ideal medium creating visibility and clarity and for highlight risks. In the event of a breach occurring, there must be planned and coordinated response that sees personnel under the direction of the nominated DPO (Data Protection Offices) expediting tasks to, where possible, mitigate the effects of a breach and in due course, inform the ICO. Process models created, validated and disseminated ahead of time promote best practice increasing the assurance that all required tasks are undertaken appropriately. The management of risks, the Achilles Heel of data protection, need not and should not exist in a separate technology silo. All employees must be aware of risks, their potential impact and the required steps they can take to ameliorate issues. New generation BPM suites connect risk registers with live processes whilst keeping responsible managers informed and alert, ready to react in a timely manner. An effective approach to GDPR is likely to trigger demand for new and incremental functionality from IT systems. With the May 2018 deadline for GDPR compliance looming, requirements for additional functionality from the line of business IT systems – some minor, some major, may result in many IT departments and IT vendors may be struggling to meet demand. 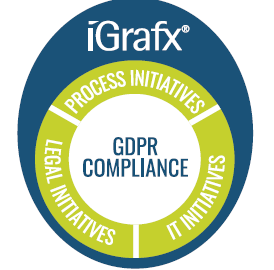 With much of the work already done, iGrafx not only provides a platform for modelling processes and GDPR related artifacts but enables the deployment of process models as workflows while providing complete transparency into the status of processes. To find discuss your vision for Compliance and GDPR and to find out more what compliance could look like and how leading organisations are transforming their approach and creating value from GDPR while meeting the 2018 deadline, contact IGX Solutions to learn more. We offer training, consulting, deployment and programme management of BPM Platform based on delivering business benefit realisation. We support Clients to implement an Evidence-Based Compliance approach to overcoming business requirement challenges.